It was a nice sunny day in Spring when I first met the gorgeous bride, originally from Egypt, at a restaurant in Chelsea, London. 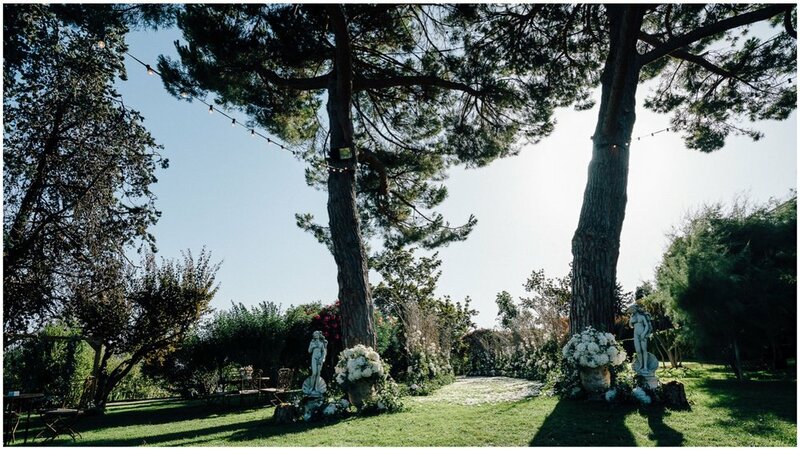 It was very clear that their ideal wedding destination was somewhere close to Barcelona. Only a few days after our first meeting, we arranged a visit to Catalonia for them to see some venues. 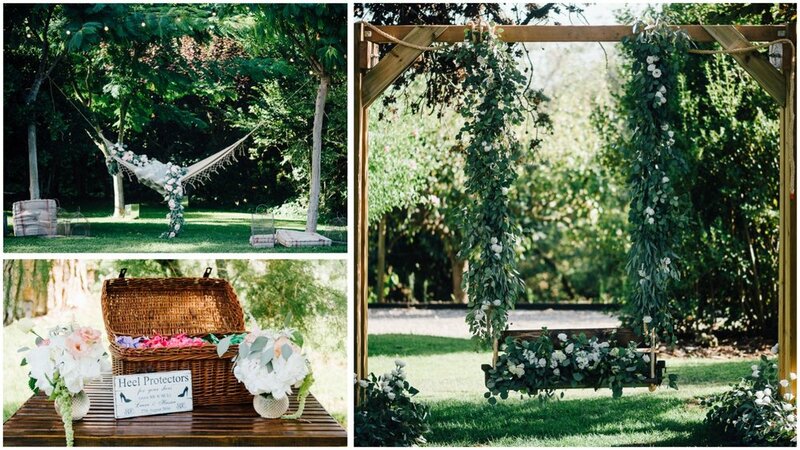 They decided to go for a stunning Masia in the countryside of Catalonia for the wedding, which would take place on a Saturday at the end of August. They also wanted a Modern white Masia by the coast for the pre-wedding party which took place the day before (more details of the party here). The arrival of the bride was something that we planned very carefully as it was the most important part of the wedding. The bride looked gorgeous in a stunning and elegant white horse carriage. Once the bride arrived and, together with her father, they walked down a stunning aisle which the florists, Bornay, lined beautifully with white hydrangeas and 2 meter high branches (scroll further down to see it!). the gardens for the canapés, the terrace for the reception and the indoor disco. 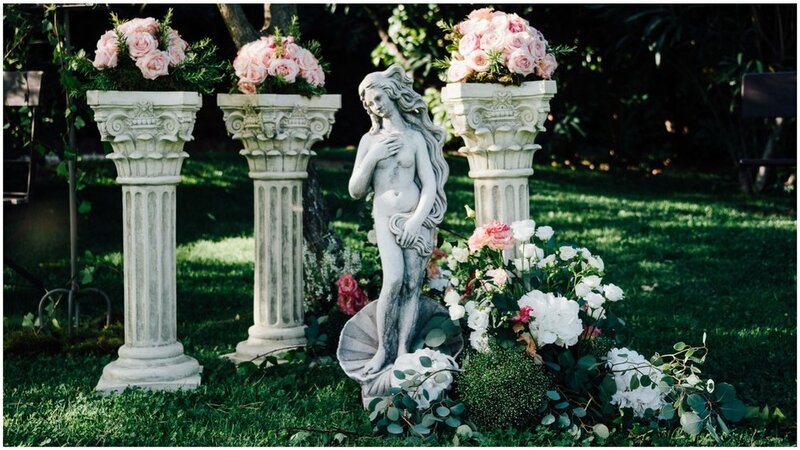 The beautiful gardens were turned into delicate, decadent and romantic French gardens using, human statues, different styles of vases and of course a variety of flowers in several colour hues. All the details were taken care of with finesse. Whilst the guests were waiting for the arrival of the bride, they enjoyed some delicious canapés, catered by Esther Conde. They were also provided with entertainment by the fantastic The Ayoub Sisters who came from the UK to join this beautiful wedding and play during the entrance of the bride. The entrance of the bride was just spectacular. She walked down a 2 metre high aisle made of tree branches and white hydrangeas and the grass floor was covered with white petals. It was just amazing. Once the bride arrived, all guests made their way to the second area of the venue: The terrace. For that, they walked through different areas of the gardens. The guests were amazed by the beautiful flower decorations such as the spiral stairs (pictured below), as well as the arch at the beginning of the tunnel that led to the terrace. The tunnel was split into two parts, the first part was covered in beautiful greenery and decorated with hanging candles. The second part was made of pebbles and decorated with beautiful flowers in cream and light pink hues, as well as olive tree branches and candles. This created a magical atmosphere for the guests and showed off the beauty of the terrace. 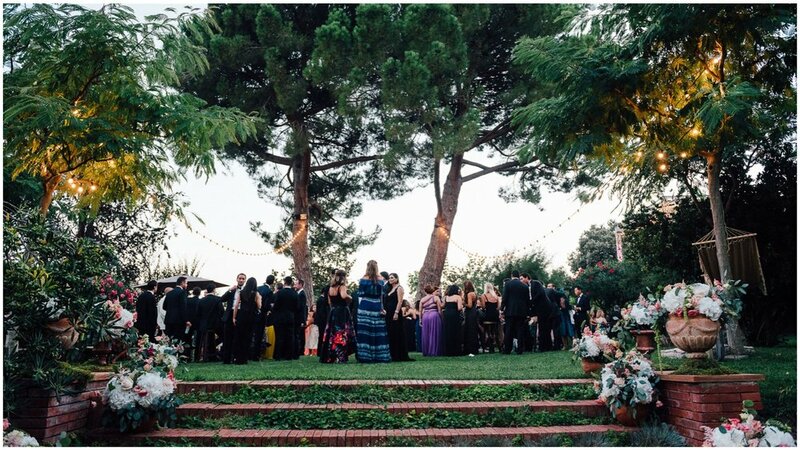 Once the guests came out of the tunnel and onto the terrace, a whole new world of pure beauty was in front of them which the guests were really impressed by. There were three different areas: the first area was for the food stalls which we placed in front of the façade of the house. The other areas were two 5 metre high wonderful structures, each one with a different purpose. 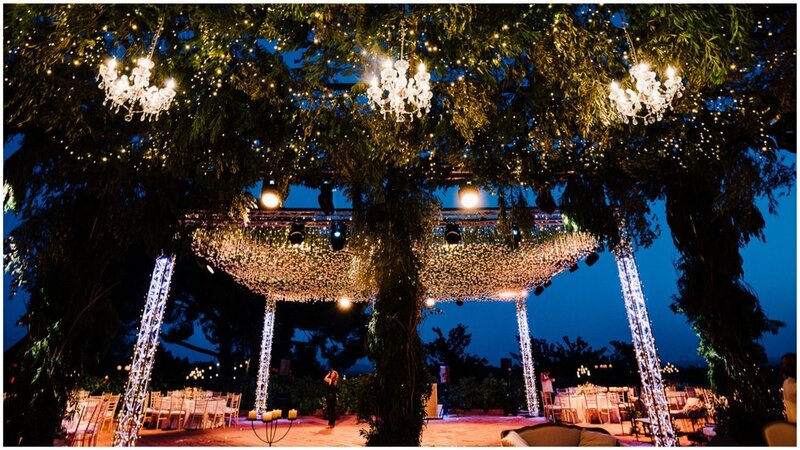 The main structure, which was for the outdoor dance floor, was made up of 10,000 carnations hanging from the ceiling. For the second one, we recreated a chilled area full of greenery, chandeliers and baroque furniture. Bornay did a pretty amazing job! The main reception was a stand up dinning mixing different table set-ups: from very formal and elegant sit-down table set-ups to low tables and sofas, which created a much more relaxed atmosphere. There were 6 different food stalls in total, all completely different and delicious styles of food, from a Japanese stall to a healthy corner including salads that the bride enjoyed whilst in London. 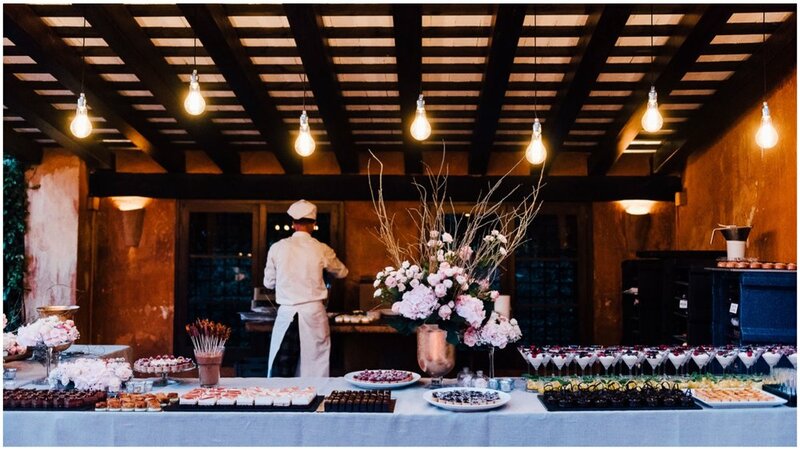 Food was very important to the couple and Esther Conde catered it in such a perfect way adapting themselves to the couple's requirements. The wedding cake was a tribute to their country of origin, Egypt. They opted for 3 pyramids of different heights full of cupcakes and macaroons. The main pyramid was higher than one metre containing 500 cupcakes with two beautiful penguins as a cake topper, which had an important meaning for the couple. The other two pyramids contained 450 macaroons in total. The final area of the wedding venue was the indoor disco that we turned into a jungle. Definitely a WOW factor that no-one expected. The indoor dance floor was decorated with different greenery falling down from the ceiling and lots of furniture such as brown chester sofas, poufs and wooden tables. The whole wedding were full of special details and lights of every kind, from colored lights to vintage bulbs, fairy lights curtains and candles. Every detail of this wedding was very personal to the happy couple and was carefully planned by us. It was an experience of a lifetime and a dream wedding, I really hope that L&H and all their beloved guests will remember it in the same way we do. It really was a magical day! "Where do I start... stressed and scared to start the prep for the big day, it would be nice to meet a kind, humble, hard working, honest person to help run it perfectly for you... and that's exactly who I met. And little did I know that Angela's team in Spain were just an extension of her exquisite charm. Ladies, for this big day you need someone you can trust, someone who is patient with you and never judgemental, supports you when you are breaking down and keeps you smiling strong no matter what disasters happen along the way! This is the Valtueña team. They believe in everything you see, and make it your reality. Perfection is never achieved to a perfectionist... But with Angela and her team... it was somehow achieved."